We master the art of soft baking and tasty pâte à choux. Choux pastry is required for profiteroles, Éclairs, Paris-Brest, St Honoré Cake, just to name a few. Crispy on the outside & soft and airy on the inside, it can be sweet, filled with cream or ice cream, or the filling of your choice. 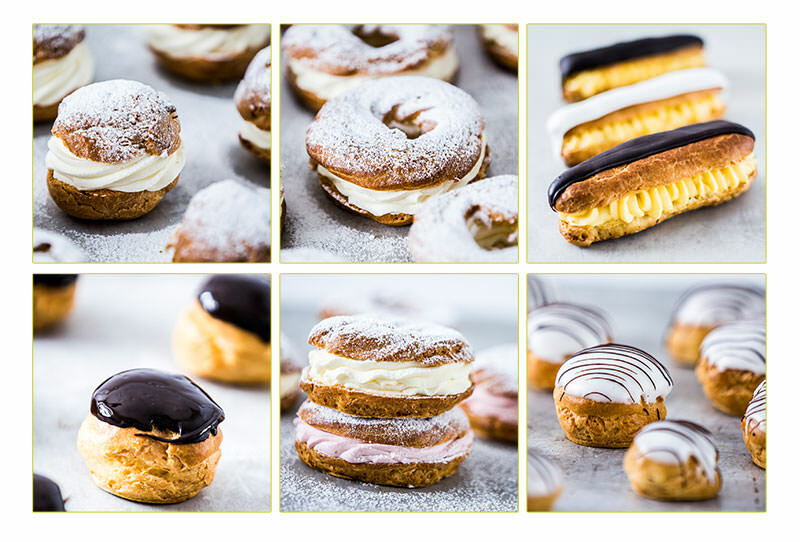 Our pâte à choux is available in different sizes and shapes: puffs, profiteroles and éclairs and mini éclairs. Also available with a butter or margarine base. Different options are available: Products ready for sale (already filled and glazed) or empty shells that you can fill yourself. We are proud to offer products filled with custard or real 35% whipped cream, available in a variety of flavors such as chocolate, lime, passion fruit and raspberry.